← Welcome To The All New Catspit Screenprinting Blog! Screen Printing News: Great New Videos On The Way! I am really excited about the new blog and I am hoping to add more valuable content to it as we move forward. Right now the blog is very much just that. It’s a personal place where I mostly write about what I am up to, what is new on the website and when new videos are uploaded to the YouTube channel. So there are often quick and very short entries about the latest activity that I have been engaged in. I also write some article type blog entries which are much like the formal articles I write for the website. I want to add more of those types of blog entries to the new WordPress blog for Catspit Productions. At the same time I don’t want the blog to become a clone of the many other garment embellishing blogs. Meaning that I want to keep my blog personal and casual. Although it does promote myself and the screenprinting educational efforts online, I don’t want it to become a commercial product. In fact, I’d like to keep all of my online presence very personal and real. Speaking of which…. on to matters of screenprinting tee shirts! 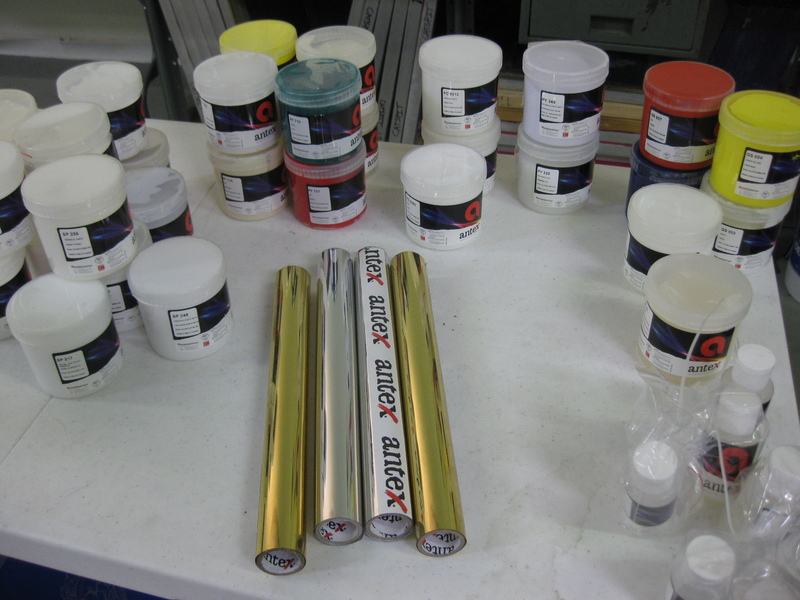 I have received some water based ink samples including some discharge inks from Antex for screen printing. They sent some inks for me to test and do videos with in exchange for a free plug. So I figured I’d start by giving you all a sneak peak at what is to come. They also sent some foil adhesive and foils. I think we have enough products to make videos about: water based inks, discharge inks, foiling, and perhaps a specialty ink effect video too. It will take some time to do all of the video work and product testing. Then it takes some time for the video to get on deck in the uploading schedule. Therefore we won’t see these videos for some time but I’ll keep you all posted! Great new videos on the way! Stay up to date witht the Catspit Blog. I do plan on releasing 1 video each week through the end of November. It takes a decent amount of work to make videos and it has to be done around or scheduled with existing print work or other business activities. But I have a lot of fun making them and interacting with the people who watch them after being uploaded to YouTube. If I had my way I would be making more videos than people would probably watch…. LOL. This entry was posted in Website Information and tagged screen printing screenprint silk screen heat transfers tee tees shirts t shirt t-shirt how to screen print garments textile supplies equipment tutorial print at home learn to print educational videos. Bookmark the permalink.